Home > Reviews > Review: Google Glass is the WORST PRODUCT OF ALL TIME! September 3, 2014 by John P.
If you’re considering buying Google Glass for ANY reason, I’m gonna try and talk you out of it. Mark your calendars folks, because this is the first time we’ve ever dedicated an episode to telling people NOT to buy a product. That’s not to say that we like everything. We’ve tested at least a thousand products that we’ve never shared with you, because they didn’t meet our expectations for one reason or another. We’d rather spend time recommending good stuff than telling you what NOT to buy. But I’m going to make an exception for Google Glass, because I honestly believe it is the single worst product I’ve ever experienced. And I’m pretty sure it’d be a terrible mistake for the vast majority of you to buy one. So I’m just going to start telling you why. This is Google Glass. It may look different than other versions you’ve seen, because three months ago I bought the prescription version. What that means is that I sent Google One Thousand Seven Hundred and Fifteen dollars and 76 cents of my own hard earned money, I waited for the order to arrive, and then had to take it in to my optometrist where I paid hundreds more, and then waited for custom lenses to be fitted. Weeks after the initial purchase I was finally able to put ‘em on for the first time, and the disappointment was nearly instantaneous. Oh by the way, you should know right up front that Google only has a 30 day return policy from the time you receive your Glass. So if it take a couple weeks to get in to see the optometrist and another couple for the lenses to be made, as soon as you put Glass on for the first time, it’s too late to return it. Even if you were willing to throw away the hundreds of dollars you spent making the custom lenses. If you wear glasses, I want you to imagine the biggest heaviest glasses you ever purchased – and then imagine something heavier. That’s Glass. If you don’t wear glasses all the time, this might be a little difficult to understand. But heavy glasses can cause pain on your nose that quickly turns to discomfort and can leave you miserable, bothered, and with a headache. On top of that, heavy glasses don’t want to stay on your face. If you engage in any sort of sporty activity, the mass just doesn’t want to stay put. Even bending over at the waist and looking straight down can make Glass feel unstable, if it doesn’t slip off your face entirely. And that can happen if you’re hot and sweaty. One possible solution would be to choose lighter frames. But there aren’t any. In fact, there are only 4 choices. Now when you buy traditional frames, they can be infinitely adjusted. Even hard plastic frames can be softened in a hotbox filled with glass beads and then bent to shape. But you simply can’t adjust Glass like this. Instead, they give you tiny wire arms with little nose pads as the only adjustment method. And it just doesn’t work well. Not to mention the fact that those nose pads are the worst way to suspend the heaviest glasses you’ll ever wear. Right about now you might be thinking, “Ok, I didn’t expect a piece of technology to be all that comfortable. I just want it to work.” Well, that’s what I was thinking at least when I first started wearing them. But then I quickly discovered that they don’t even live up to the most basic of expectations. What I mean is, if you go to WalMart and spend $99 on a cheap Android tablet, it will literally do everything better than your $2,000 Google Glasses. For example, the battery life is nothing less than abysmal. The battery won’t last more than a few hours at most. And if you try to take a lot of photos or video, you can literally wear out the battery in 45 minutes. Seriously, I went from fully charged to virtually dead in under an hour. What’t the solution for that? Don’t use them? Even in an absolutely best case scenario where you are hardly doing anything with them, they won’t last even 6 hours. Think about that. Now you have to start planning out which part of your day you want to use your glasses! But it gets worse. You can’t turn off and charge the Glasses. I mean that. You can turn them off. But as soon as you plug them in to charge, they turn on! And it’s impossible to ever know if they are really off. So let’s say you had some important event you wanted to use them for. And you charge them up with the intention of leaving them off and turning them on right before you need them. Well, it’s just not going to work. Not reliably. Because they just turn on randomly and there isn’t a power switch where you could make sure that you aren’t using the power. It’s just impossible. Essentially, Glass has only two power states – plugged in, or near death. Right now some of you are probably saying, well I only really need to use the Glass functionality occasionally. I’ve got other glasses I’ll wear most of the time. That’s what I used to think too. But then I found out that Glass is magically crash-tastic. There are so many times when I tried to do something very simple like take a photo or video, and Glass simply didn’t respond to anything. It’s supposed to turn on when you tilt your head or tap them with your finger, but frequently nothing will make them respond at all. You just have to try a reboot. Keep in mind that a reboot of Glass will take about 10 minutes. Maybe more. First it takes Glass MINUTES just to start up. But then it takes several more minutes before you can do something like simply snap a photo. Well, if it takes 10-15 minutes to get to the point where it can take a photo or video, and the battery is only going to last an hour, you can see how that would get really frustrating and eventually not be worth it right? But it gets worse. Because if you are going to take a picture, or shoot a video, you probably want the image to at least be straight, right? But the way the frames are built, the screen and camera are physically crooked. They’re only horizontally adjustable, no vertical adjustment whatsoever. Who in God’s name invented that? This means that if your ears are a little higher or lower you will not be able to see the screen appropriately, it also means it’s impossible to wear the glasses and have the display actually be horizontally level. That’s right, when they’re on my head, they’re crooked. So if you want to shoot something, you’re going to have to walk around holding your neck crooked to compensate, which makes you look like an idiot, and also hurts. Speaking of hurting. Glass uses a little bone conduction speaker that kind of barely does the job of letting you hear things, as long as there isn’t too much noise. But I sprung for the add-on earbuds. Little did I know they’d be the most uncomfortable earbuds I’ve ever used in my life. I think I’d rather have one of those Ceti eels from The Wrath of Khan inserted in my ear. Oh, and they’re USB! Not only is the interface non-standard, for no good reason, but if you have them on you can absolutely not charge the glasses while using them because they all share the one and only USB port. Why? I mean seriously, why didn’t they just include a standard earphone jack? Of course, if you were gonna listen to music, you’d run out of battery so fast you’d have to take em off before long just to recharge ‘em. An iPod or any cell phone is far better suited. I could go on about how these “Glasses” won’t fold closed, which makes storing them difficult, and a bunch of other things. But really, I hope you’ve heard enough. I can’t NOT recommend Google Glass enough. I wish someone told me all this before I dropped over $2,000. Hopefully it helps other people. Tweet me @johnpoz if it helps you. That might be the only value I get from spending the money. The problem is, it’s a very bad answer to a question most people simply aren’t asking. I’m guessing we’re 10 years away from a viable connected heads-up display device that’ll really enable augmented reality, social and creative recording capabilities, and general voice command functionality. Until then, these are just expensive gadgets for bleeding edge early adopters with too much money on their hands. So if you’ve got expendable cash, and you want to show the world how geeky you are, maybe you can buy a Geek Beat mug or something. I have a hard time taking this review seriously. First, you’re reviewing a beta product that hasn’t been released yet and comparing it to final products that have been on the market for a while. Second, you’re only reviewing the version with lenses and saying these things make all versions of the product bad. What about the HUGE number of people who wear contacts or on’t even need vision correction? Some of these also seem like huge exaggerations. 10-15 minutes to take a photo? Come on… There are many happy glass users taking pictures every day with it. I’ve spoken with many online and in person and this is the first time I’ve ever hard of such a thing. I understand your skepticism. And you know what? That’s all I really want. A healthy skepticism! To address your first point, this product is NOT a Beta. I don’t care that Google is still labeling it as such – they did that with GMail for like 6 years! It is in general release, and they are marketing the HELL out of it to the public. 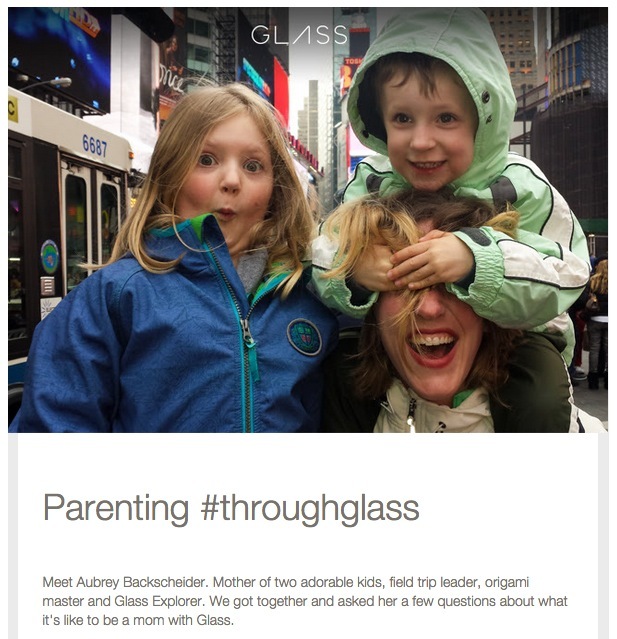 When Google targets Moms as part of agressive email campaigns, they can’t hide behind the “Beta” monkier. Their entire website is designed to simply SELL you on all the life changing enhancements you are going to get with glass. And they have an aggressive Google AdWords campaign that has been blanketing websites with ads to sell the product. Actions speak louder than words. And if they are going to aggressively pursue people’s money, it is fair for them to be taken to task when they don’t deliver. Secondly, YES, 10 minutes to take a photo! I chose my words VERY carefully, and the people in our office have witnessed this with my Glasses. It takes minutes to boot up, and then minutes more for the device to respond to input for some reason. There is a difference between people loving and being attached to the concept of Glass – and being satisfied with the actual product. I’m speaking for the general consumers of the world, and I stand by my every single assertion. Perhaps I’m the only one who isn’t afraid to do it? John P, Is there anything positive about google glass? My perspective on glass would be completely different if Google wasn’t charging people huge amounts of money and marketing very hard to push it. The concept of glass is a noble one. The non-prescription version seems to be an acceptable design to most people. I guess it works OK as long as you’re not trying to use it as a primary pair of glasses. it also integrates well with Google services. I’m really struggling for much else to say positive about it. 1) 8 hours regularly w/ Glass (about 90 mins with Nav turned on and then a bunch of text/im throughout the day. Rare phone call) Didn’t bother to mention the upside of a small battery; it charges in about 1 hour. 2) Yes, you can turn it off while it is charging. a) Plug it in b) Turn it off. Glass is now off and charging; certainly didn’t find it that confusing. 3) You are exaggerating with the reboot time. Just like most users, you seem prone to have lost temporal perspective. I honestly believe you think it took 10 mins; but in reality it takes my Glass about 55 seconds to go from Off to On. 4) Finally, did you really not read any reviews, try Glass (you must know people who have a pair), or done any research at all? None of what you mention is surprising except for the extraordinary exaggeration in your review. This type of technology needs to start somewhere and this is the start. You stated that in 10 years we may have something workable. That might be true if companies are not pushing the limits of what technology can do. With the inroads that Google and other companies are making with wearables will see pervasive computing become a reality in much less time. Sorry, but your review was pretty far off the mark. The boot up time I quoted was measured by an actual stopwatch before I chose to make a video. You may have a very different experience with your unit, but if there’s that much variability between these devices then they shouldn’t be selling them for $1,500. You may be satisfied with 90 minutes of battery while navigating, but for general consumers that is an abysmal number. & I would not accept it if I were you. Finally, you seem to be confusing me with average people. But I test technology for a living. I guarantee I’ve had my hands on many times more devices than just about anyone else. I’m not an amateur. if this product were being put out by anyone other than Google, everyone would be ripping it to shreds.